Currently I teach Math and Mathematical Art full-time at John Burroughs School, but I've been a classroom teacher since 2006. While at Saint Ann's School in Brooklyn, I cofounded a mathematical art program for grades 3-12 which included a high school seminar, a middle school elective, and an all-school mathematical art festival called MArTH Madness. Details of the Saint Ann's math art program can be found in our paper, and other career information can be found in my cv, at the bottom of this page. In 2014, I founded Art of Math STL so that I could share mathematics with kids outside of the math classroom. In addition to private sessions, I run a pair of math circles at Reed Elementary. For many years, I've coauthored Math Munch, a site where anyone can find a curious and enticing thread to follow out into the mathematical internet. For a couple of years I wrote a blog about math and school, called Lost in Recursion. For the time being it can still be seen. Me circa 2007, at Trinity-Pawling School. 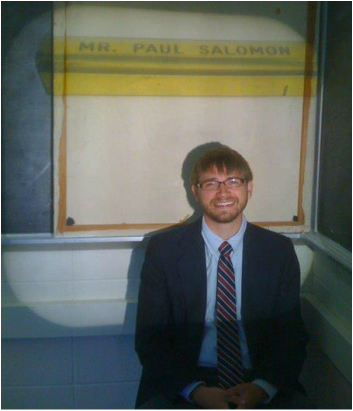 An overhead projector shines through the nameplate my sister made me in 6th grade.